Newt Gingrich lashed out at members of the "propaganda media" on Tuesday, calling them "idiots" who can't handle "the level of talent they are dealing with" in President-elect Donald Trump. In a speech at the Heritage Foundation in Washington, D.C., the former House speaker outlined how Trump used his mastery of the media to overcome negative coverage throughout the campaign. "One of the great disgraces of the propaganda media—all of us on the right should drop the term news media until they earn it—is that it cannot come to grips with the level of talent that it is dealing with," Gingrich said. "He had an instinct for totally dominating the media." Unlike other politicians, Trump had the "guts" to stand up to the media and challenge their reporting, Gingrich said. 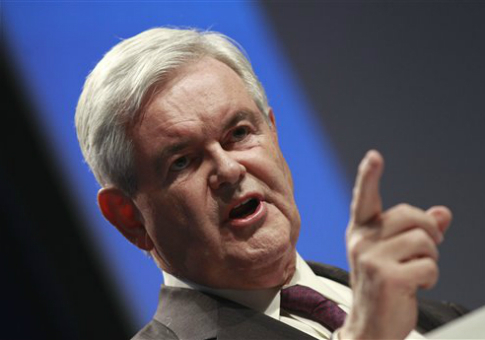 "If you attack Trump, he immediately counter-attacks," Gingrich explained. "The media doesn't understand—it's not a function of personality. He learned with the New York media that you hit back as fast as you can so you're the next edition." "It's part of his style," Gingrich said. "If you show him an opening, he'll take it." "When the propaganda media smeared Trump, the American people sided with Trump," he said. Gingrich said the media was so focused on attacking Trump that it failed to understand him. "It's astonishing to me, as a historian, how the elite media has missed all of this," Gingrich said. "They're so ideologically committed and terrified of defeat that they can't stop and ask themselves, ‘What is this anomaly? What is this remarkable thing?'" Gingrich also said that all the "idiots" who got everything wrong for the past two years are now covering his cabinet choices when they should instead be looking for new jobs. "The same idiots who failed to understand that Trump was going to win the nomination and then failed to understand that Trump was going to win the general election, are now commenting on Trump's cabinet," Gingrich said. "It would be like having a sports reporter who misreported a football game by writing about how many home runs were hit—you would get a new reporter," he said. "You have people at the New York Times and the Washington Post who have been consistently wrong now for two solid years, and they get promoted because their editors were even more wrong." This entry was posted in Politics and tagged Donald Trump, Newt Gingrich. Bookmark the permalink.